We’d love your help. 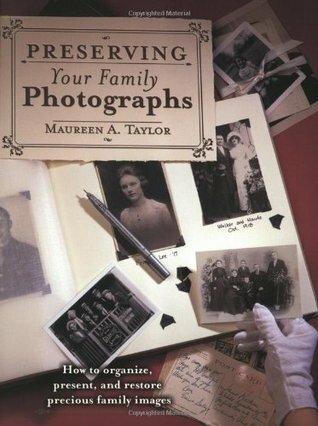 Let us know what’s wrong with this preview of Preserving Your Family Photographs by Maureen A. Taylor. Learn how to care for family photos, learn basic conservation techniques, buy the proper storage materials, then organize the family photo archive and safely display it for all to see. To ask other readers questions about Preserving Your Family Photographs, please sign up. Good information, though many of the recommendations relating to online/software are dated. A good resource (but dated) on how to organize and preserve family photographs, including the oldest ones in a collection. The book contains some solid tips especially for those who have been, maybe, a bit too cavalier with their pictures and who want to learn more on how to keep them for future generations to treasure. I believe the author has come out this year (2010) with a new edition or updated version that covers digital photographs as well. Key highlights: When purchasing clear sleeves for photos, make sure to buy polypropylene or polyester ones. Polyethylene is not approved for long-term storage. Use only acid freee papers, boxes and tissue. Digitize your photos and store off-site as a backup. Plan for media obsolenscence. A bit dry to read, but all the info was very useful. Particularly interesting was the chapter on preserving digital images, in that you really ought to print out anyway, because that will last longer than your particular technology. A good resource for the topic, although it's a bit dated. Looking forward to seeing the new, updated edition. A fabulous resource for anyone with a collection of family photos. 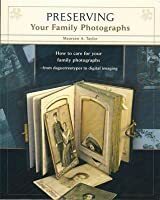 Good handbook for the amateur archivist; introduces technical details about early photographic techniques and suggests useful systems for organizing your images. Maureen Taylor is a frequent keynote speaker on photo identification, photograph preservation, and family history at historical and genealogical societies, museums, conferences, libraries, and other organizations across the U.S., London and Canada. She’s the author of several books and hundreds of articles and her television appearances include The View and The Today Show (where she researched and Maureen Taylor is a frequent keynote speaker on photo identification, photograph preservation, and family history at historical and genealogical societies, museums, conferences, libraries, and other organizations across the U.S., London and Canada. She’s the author of several books and hundreds of articles and her television appearances include The View and The Today Show (where she researched and presented a complete family tree for host Meredith Vieira). She’s been featured in The Wall Street Journal, Better Homes and Gardens, The Boston Globe, Martha Stewart Living, Germany’s top newspaper Der Spiegel, American Spirit, and The New York Times. Maureen was recently a spokesperson and photograph expert for MyHeritage.com, an internationally known family history website and also writes guidebooks, scholarly articles and online columns for such media as Smithsonian.com.